You don't know what's been on them! Every day is like a an education session on what we should and shouldn't do on planes. So, because all this information is mounting, we're going to do a quick recap session on the best bits. 1. Never take your shoes off. 2. Don't drink the water! 3. Don't order a Diet Coke. 4. Don't try and open the emergency exit because it's futile. Got it? Good, time to move on to the next MASSIVE "don't." Yep, Jessie Char tweeted the pic of our worst nightmares—creepy feet creeping onto the armrests of the seat in front of them, creepily. And what happened next was even creepier. We've all flown with annoying people before but AMIRIGHT that this is just wrong on so many levels?! And if that makes you want to sanitize the arm rests the next time you travel, you might want to listen up, because there's one part of the plane that is even more gross and should be avoided at all costs. 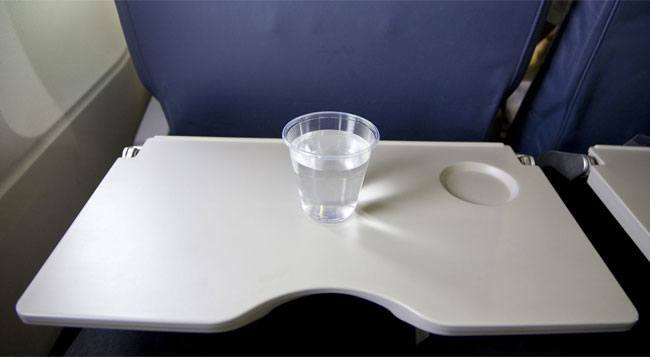 Unfortunately, the tray table, aka the part of the plane where you place your FOOD, is unlikely to be anywhere near as clean as you think. In fact, to quote a previous piece we wrote on the 10 surprising facts of air travel (give it a read, go on, it's good): "tray tables are rarely sanitized, despite the fact that they’re used as headrests, footrests, baby changing tables, food trays, used tissue storage, and fingernail clipping stations." Next time you travel make sure you pack some disinfecting wipes.